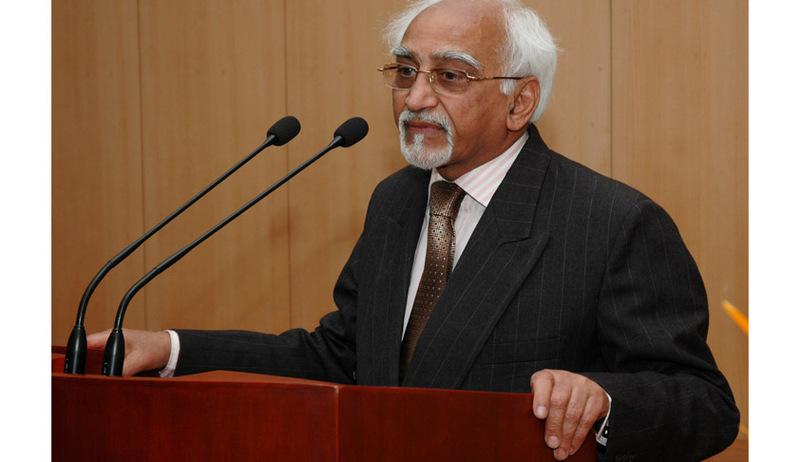 The Vice President, Shri M. Hamid Ansari has underlined the centrality of the judiciary in securing the Constitutional rights of citizens. He was addressing the 16th Convocation of University of Jammu, in Jammu today, which was attended by the Governor of Jammu & Kashmir, Shri N.N. Vohra, the Chief Justice of India, Justice T.S. Thakur, the Vice Chancellor of University of Jammu, Prof. R.D. Sharma, other Dignitaries, Faculty Members and Students. The Vice President said that people increasingly turn to the judiciary for solving social problems due to its accessibility, affordability and confidence that justice will be dispensed speedily. He further said that any discussion of the constitutional ideal of India being a ‘secular’ republic having a ‘composite culture’ has to be premised on the existential reality of the society which is characterised by heterogeneity. The Vice President questioned how the Indian State, in principle and practice, has given shape to the essential ingredients of the secular principle and composite culture. Apart from the principles enshrined in the constitutional text, the policy pronouncements of public figures, often nuanced to suit the occasion and judicial pronouncements shed useful light on the matter, he added. Quoting eminent jurists, the Vice President said, that unless the Court strives in every possible way to assure that the Constitution, the law, applies fairly to all citizens, the Court cannot be said to have fulfilled its custodial responsibility. The Vice President added that Indian secularism has been described as ameliorative whose spiritual core is incrementalism and that a citizen could well hope that this incremental approach is used to enhance social cohesion and social peace. “This is indeed a special occasion. The university is honouring one the most eminent sons of the State of Jammu & Kashmir whose achievement is but a rarity and worthy of celebration. After all, it is only the chosen few in the calling of law who climb the ladder to the very top in the highest court of the Republic to join the galaxy of men who have presided over the Supreme Court of India. Our founding fathers gave us a Constitution that encapsulates in its text the ideals and values of People of India. The first among these is Justice and, as John Rawls put it, ‘rights secured by justice are not subject to political bargaining or to the calculus of social interests.’ To ensure this, Article 32 of the Constitution gives us the right to move the Supreme Court which has the power to take corrective measures for the enforcement of these rights. A similar power is conferred, within their area of competence, on the High Courts, under Article 226. An essential concomitant of this is accessibility of the judiciary; another is affordability; a third is the confidence that justice will be dispensed speedily. The latter is contingent not only on the technicalities of the law but also on the unstated major premise underlying the thought process. It is said that the judiciary is above but not beyond the issues of the day. ‘We may try,’ said the American judge Cardozo, ‘to see things as objectively as we please; none the less, we can never see them with any eyes except our own.’ And yet, he continued, ‘the training of the judge, if coupled with what is styled the judicial temperament, will help to broaden the group to which his subconscious loyalties are due.’ Hence arises the need ‘of constant checking and testing of philosophy by justice and of justice by philosophy.’ To this may be added Lord Bingham’s caution about the need for judges to ‘neutralize any extraneous considerations which might bias their judgement,’ or else decline to make the decision in question. This is precisely what is prescribed in the last part of the Preamble of the Constitution of India. The operative principles are fraternity, dignity, and unity to be sought through Justice, Liberty and Equality. One of the matters in the societal domain that figure prominently in public discourse relate to the constitutional ideal of India being a ‘secular’ republic having a ‘composite culture.’ The former expression is in the Preamble and the latter in Article 51A(f). Teri dunya ki raonaq barh gai sheikh o barahman se"
Our democratic polity and its secular State structure were put in place in full awareness of this plurality. There was no suggestion to erase identities and homogenise them. Political scientists and sociologists have written a good deal on the Indian perception of secularism. The three generally accepted characteristics of a secular state, namely liberty to practice religion, equality between religions as far as state practice is concerned, and neutrality or a fence of separation between the state and religion, have been invoked but ‘their application has been contradictory and has led to major anomalies.’ Commenting on the debate on secularism, Amartya Sen observed that ‘secularism is basically a demand for symmetric political treatment of different religious communities’ but that leaves open ‘the choice between the forms that symmetry can legitimately take’; he added that ‘there is a real difference between achieving symmetry through the sum-total of the collective intolerances of the different communities rather than through the union of their respective tolerances.’ Very recently, Soli Sorabjee has reminded us of the Emmanuel v. State of Kerala and of Justice Chinappa Reddy’s remarks on the subject of tolerance. The challenge, then, is to reduce if not eliminate these anomalies. This leads us to the question: how has the Indian Sate, in principle and practice, given shape to the essential ingredients of the secular principle and composite culture? Apart from the principles enshrined in the constitutional text and policy pronouncements of public figures, often nuanced to suit the occasion, judicial pronouncements shed useful light on the matter. The difficulty lies in delineating, for purposes of public policy and practice, the line that separates them from religion. For this religion per se, and each individual religion figuring in the discourse, has to be defined in terms of its stated tenets. The ‘way of life’ argument, used in philosophical texts and some judicial pronouncements, does not help the process of identifying common principles of equity in a multi-religious society. Since a wall of separation is not possible under Indian conditions, the challenge is to develop a formula for equidistance and minimum involvement. For this purpose, principles of faith need to be segregated from contours of culture since a conflation of the two obfuscates the boundaries of both and creates space to equivocalness. Furthermore, such an argument could be availed of by other faiths in the land since all claim a cultural sphere and a historical justification for it. The ‘social and cultural life in India incorporated within it a multi-regional and multi-religious form and content. This interpretation of cultural influences was neither uniform nor equally intense in all regions. Yet their presence is marked all over. As a result, although historically cultural transactions and social negotiations embraced the entire subcontinent, they led to variety and plurality rather than to homogeneity. In almost all realms of cultural production – music, drama, painting, architecture, and so on - as well as religion, different influences made their mark, imparting to them a composite character. As a result, historically India developed as a colourful cultural mosaic and not as the manifestation of cultural practices inspired by a single source. The dynamism of Indian culture is derived from this diversity, which moulded the cultural practices of the people. It is in this sense that culture was embedded in national identity. Karwaan aate gaye, Hindostan banta gaya"
It is evident from the foregoing that despite the clarity of enunciation in some of the Bommai pronouncements, political perceptions have sought to interpret its intended meaning for their own purposes. Is it therefore bold to expect that the Supreme Court may consider, in its wisdom, to clarify the contours within which the principles of secularism and composite culture should operate with a view to strengthen their functional modality and remove ambiguities that have crept in? Indian secularism has been described as ameliorative whose spiritual core is incrementalism. A citizen could well hope that this incremental approach is used to enhance social cohesion and social peace. I felicitate Chief Justice Thakur on this very happy occasion and thank the Chancellor of the University, Hon’ble Governor Narendra Vohra sahib, for inviting me today.